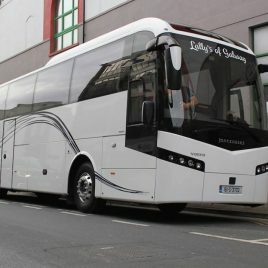 Lally Tours is a family owned company that has been proudly touring and showcasing the West of Ireland since 1988. We provide more than just guided sightseeing tours of Galway – our professional drivers and guides are here to help you experience the best of the West of Ireland. We invite you to explore the awe-inspiring Cliffs of Moher, the majestic mountains of the Connemara and desolate beauty of the Aran Islands. Escape the hustle and bustle of the City and spend the day experiencing some of the most natural untouched regions of Ireland. As you travel from Galway, listen to your expert driver/guide share the origin of this language and how it is still the native language of Connemara, despite its diminishing status in the rest of Ireland. Exit the coach to visit iconic Irish landmarks and landscapes independently. You will experience the expansive skies of ever-changing light that so many painters have strived to capture for generations. Find the reasons why Hollywood directors chose Connemara as backdrops to movies such as The Quiet Man (John Wayne and Maureen O’Hara), The Field (Written by John B. Keane, starring Richard Harris and John Hurt) and most recently, Marley & Me (Starring Owen Wilson and Jennifer Aniston).